Back-to-school blogging has left me feeling nostalgic. It’s likely the reason that while prepping for this entry I reminisced about the game Rock-Paper-Scissors. During my early school years this was the way we kids decided pretty much everything. Rock-Paper-Scissors doesn’t use actual rocks,paper, or scissors. Only hands, count to three: “Rock-smashed-scissors, scissors-cut-paper and paper-covers-rock.” Best out of three won. Without question Rock-Paper-Scissors Justice worked! Now, in the present Rock is music, Paper means work, so where does that leave Scissors ? Good news, they’re still for cutting and the winners are Westcott® scissors. Teachers, Crafters , Professionals and Students will find a wide variety of handle styles, assorted colors, tip styles and blade lengths – Westcott® are the way to go. 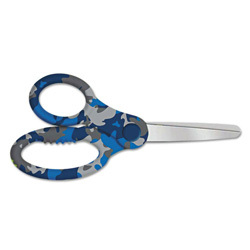 How about some Camouflage Blunt or Camouflage Pointed scissors? They could be a great conversation piece, especially if you’re just getting started at a new school! Teachers, do your students need a softer touch? Kids Anti Microbial Soft Handle Scissor Teachers Pack include 12 pair in assorted colors. While the Antimicrobial Scissor Caddy includes 24 pair of 5 inch blunt-tipped style, held together in four colorful, removable cups for easy storage and supply distribution. Finally my personal favorite, for the grown-ups are the Kleencut Shears. I like these primarily because being left-handed, I find that lots of ‘good’ scissors are made to be used with the right-hand only. The straight, Kleencut Shears can be used both Lefty or Right-y and are an awesome “all-purpose” scissor to have handy. Until the next time, keep your Product Reviews coming! The next drawing will be here before you know it and someone will win a $100 Shopping Spree.